Want to free communication in short distance?. Output power: <5W. This piece of two-way radio can connect each other in remote area or wild field, where shell phone signal is poor. With latest techapplied, it is very easy to use these. Intercom distance:150m( open area). Each intercom uses four AG13 button batteries. Stimulate the interest of wireless communication of your children. The characteristics of camouflage Clock & Headphone style, you can place it in your ear. 2 x Handheld Two-way Radio Walkie Talkie. Transmit power:0.5W. Channel scan and channel lock design. Auto channel scan. Automatic battery save. Page tone alert and low battery alert. Otherwise, we can not receive it. 2 x Walkie Talkie kids toy. Battery: 2x PPP3 battery (not included). Functions: Make communication easily. We will always here to solve them for you. It won't help the problem to be solved. Material: Plastic. This 10pcs Walkie Talkie is helpful for these circumstances: security guard, supermarket connection, construction area indication, most helpful for field survival, biking and hiking. Output power: <5W. USB Programming Cable CD for Baofeng UV-5R 666S 777S 888S UV-B5 UV-B6 Radio. 100% new USB program cable for Kenwood Linton Puxing Baofeng type radios. BaoFeng Radio Note: This cable Cannot be used for baofeng UV-3R. 2 x Handheld Two-way Radio Walkie Talkie. Transmit power:0.5W. Channel scan and channel lock design. Auto channel scan. We will always be here to listening to you & give you advice. Automatic battery save. This USB Programming Cable is only for BAOFENG BF-T1. Easy operation,unlike the common USB programming cables available on website,these cables just work by simply plugging and playing. High performance USB programming cable and easy to write，it is more powerful for using. Item Type: Toy Walkie Talkies. 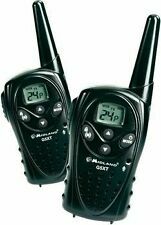 1 pair x watch walkie talkie(Batteries Included ). Funny interphone toy. Seven Function: 1.walkie-talkie 2. magnifying lens 4. as a light on night 5. compass 7. Range: 150 M.
BINATONE TERRAIN 550. Replace the batteries carefully, refer to you user guide for correct instructions. (NOT SUITABLE FOR THE TERRAIN 650 OR. ,SEE PICTURES AND COMPATIBLE LIST BELOW. COMPATIBLE WITH. ). 1 x 2 Handheld Two-way Radio Walkie Talkie. GN ENTERPRISES. -Transmit power: 0.5W-. -Channel lock. -Channel scan. -Low battery alert. -Shell Material: High-quality plastic. A Perfect Xmas gift for kids. 1 x High Quality SIA 2 Pin Security Earpiece Headset for Kenwood Baofeng Radio. With this earpiece you can clip it onto your shirt and begin using your radio with no hands. It has a built in microphone in the PTT switch and a transparent tube connecting the ear bud making you look like a secret service agent or a body guard. (9) Automatic switching among bluetooth cell phone, intercom, stereo music. Intercom up to 6 hours. Supported Bluetooth Profiles: Bluetooth Headset and Hands free Profiles with Automatic Detection. (6) FM Radio function. Original Baofeng Programming Cable for Two Way Radio Used for Baofeng UV-5R/5RA/5R Plus/5RE, UV3R Plus, BF-888S, BF-F8 , BF-F9 , GT-3, GT-5. USB Programming Cable & Software BaoFeng UV-5R/5RA/5RE BF-888S Two-way Radios. This 8pcs Walkie Talkie is helpful for these circumstances: security guard, supermarket connection, construction area indication, most helpful for field survival, biking and hiking. Output power: <5W. BT ITEM CODE 004194. Replace the batteries carefully, refer to you user guide for correct instructions. BT FREEWAY FM WALKIE TALKIES TWO WAY RADIO. four external connectoions (2 at one end and 2 at the back), SEE PICTURES AND COMPATIBLE LIST BELOW. This radio is perfect for teams looking to improve their communication. Superior chip adopted, these walkie talkies ensure that your team can maintain clear and organized communications. Also these mini radios are easy to hide in the pocket and will not affect the dress. (Model BAOFENG UV-9R Plus. Frequency Range VHF:136-174MHz UHF:400-520MHz. 12) Voice Prompt. 7) Wide/Narrow Band Selection. Mode of operation：Simplex or semi-duplex. 9) Dual Band Standby. 19) Dual Band, Dual Display and Dual Standby. VOX Voice Transmission. Signal to noise ratio: 40dB / 35dB. Modulation mode: 16KΦF3E / 8KΦF3E. Spurious Response: ≥60dB. Each channel can set different CTCSS / DCS, DTMF signaling, reject redundant calls from other stations. BINATONE MR250. Replace the batteries carefully, refer to you user guide for correct instructions. (NOT SUITABLE FOR THE TERRAIN 5 50 OR 650). Approx Size. Overview: The Bluetooth interphone Headset is designed for the motorcycle rider and passenger who wish to have clear and reliable wireless communications while riding(need two interphones). This headset works with any Bluetooth equipped mobile phone. Designed and Engineered for Heavy-Duty Performance. This headset is compatible with Bluetooth cellular phones and can be suited to any sort of helmet for motorcyclists. This device allows bikers to receive GPS voice instructions, communicate with the passenger on the back seat, to conduct calls on their mobile phone and listen to the music or their MP3 player. Last but not least, the device offers biker to biker intercom communication. .
Want to free communication in short distance?. Frequency Range: UHF:400-470MHz. This two-way radio can connect each other in remote area or wild field, where shell phone signal is poor. With latest techapplied, it is very easy to use these. 1 x 2 Handheld Two-way Radio Walkie Talkie. -Transmit power: 0.5W-. -Channel lock. -Channel scan. -Low battery alert. -Shell Material: High-quality plastic. A Perfect Xmas gift for kids. MOTOROLA TLKR T3 T4 T5 T6 T7 T8 T50. Replace the batteries carefully, refer to you user guide for correct instructions. ,SEE PICTURES AND COMPATIBLE LIST BELOW. COMPATIBLE WITH. BINATONE TERRAIN 650. Replace the batteries carefully, refer to you user guide for correct instructions. (NOT SUITABLE FOR THE TERRAIN 5 50 OR MR250). SEE PICTURES AND COMPATIBLE LIST BELOW. COMPATIBLE WITH. 2 x Walkie Talkies. Battery Type: Lithium Battery. Protect sound from the interface of signal. Talk Range: 5-10 km. Battery Life Theory: 10000 Hour. 2 x 110~240V UK Plug Power Adapters (110cm). Battery Capacity: 2800 mAh. (BINATONE TERRAIN 550 AND TERRAIN 750. Replace the batteries carefully, refer to you user guide for correct instructions. NOT SUITABLE FOR THE TERRAIN 650 OR MR250). Approx Size. ,SEE PICTURES AND COMPATIBLE LIST BELOW. For Retevis: RT-5R, RT-5RV. For TYT: TH-F8 TH-F8 . For Baofeng: UV-5R, UV-5RV, UV-5RB, UV-5RC, UV-5RE, UV-5REplus. And it is very easy to use. It can be placed flat on a desktop or mounted on a wall. IXNN4002A, IXNN4002B. Replace the batteries carefully, refer to you user guide for correct instructions. MOTOROLA TLKR T3 T4 T5 T6 T7 T8 T9 WALKIE TALKIE RADIO. ,SEE PICTURES AND COMPATIBLE LIST BELOW. Speaker Mic for Baofeng, for Kenwood,for Linton, for Puxing, for Wouxun Radio. for BAOFENG handheld Radio for Kenwood handheld Radio 1 x Speaker Mic for two-way radio. Microphone Size: 9.7 6.7mm. Speaker Size: 36mm. Heavy duty Handheld Speaker Mic For Kenwood THF6 BAOFENG UV5R Linton RELM Radio. TYT Kenwood Z Tactical Bowman Elite II Military Headset For Baofeng 2 Pin Radio. SMA-Female Connector Dual Band 144/430Mhz Foldable CS Tactical Antenna For Walkie Talkie Baofeng UV-5R UV-82 Ham Radio Antenna. 2 x Walkie Talkie kids toy. Battery: 2x PPP3 battery (not included). Functions: Make communication easily. Material: Plastic. If you haven't received item. Color: Black. Item size: Approx.19.5 6.4 3.8 CM. 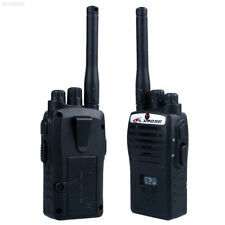 2X Walkie Talkie Kids Electronic Toys Portable Mini Two-Way Radio Set. 2X Mini Walkie Talkie Kids Electronic Toys Portable Two-Way Radio Set. Built-in flashlight. Transmit power: 0.5W. Channel lock. Channel scan. Frequency Band: PMR 446MHz. HIGH-TECH KIDS WALKIE TALKIES: With 8 channels of two way radios,Ounuo walkie talkies give you the ability to communicate interference free. EASY-TO-USE: Large buttons and simple, clear functionality makes it easily use our walkie talkies. Military Army Radio PRC 343,Marconi, Selona, Selex ,bowman H4855. Condition is New. For Baofeng UV-9R BF-A58 BF-9700. This walkie talkie microphone has a clip on the back which allows you to easily clip it on your clothes,belt and carry it with your while you don't use it. This two way radio speaker has a indicator light on the surface,so you can easily know if the speaker is working. 2x Handheld Two-way Radio Walkie Talkie. Shell Material:High-quality plastic. Batteries:Use 3xAAA size batteries (not included). Auto channel scan. It has LCD backlit function. Transmit power:0.5W. Brand Unbranded MPN Does not apply UPC 190268699860 EAN 190268699860 ISBN 190268699860 Designer/Brand Unbranded. Range up to 6km (range may vary depending on terrain and atmospheric conditions). 2x Walkie Talkie for kids. 3 Levels Hands Free (VOX) capable. Built in flashlight. 38 Interference eliminator codes CTCSS. Walkie Talkie Type: Portable. Adapt to a variety of models of walkie-talkie on market, waist hanging, chest hanging, shoulder hanging are available, easy to use. Storage Channel: Based on radio. It is widely used by people that work in police station, military, hospital, security office, eatery and many other places. BINATONE ACTION 850 WALKIE TALKIE TWO WAY RADIO. BINATONE ACTION 850. ::: Battery Cell UK :: Compatible NiMH BATTERY. This will optimize charging of your battery and prolong the life of your battery. 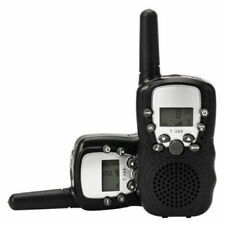 2 x Handheld Two-way Radio Walkie Talkie. Transmit power:0.5W. Channel scan and channel lock design. Auto channel scan. Automatic battery save. Page tone alert and low battery alert. Batteries:Use 3xAAA size batteries(not included).